The 4th of July can make for great times with our family and friends. But that is’t always the case for all family members. The ones I’m speaking of our our four-legged friends. The reason I want to cover this topic is because of our own experience over 20 yrs ago when we lived in Phoenix, AZ. We had two dogs named Rick and AJ. My husband and I took our young daughters to the fireworks display that was close to our house. We put our dogs outside. We had an 6ft high perimeter fence so we thought all was good. Little did we know that things weren’t good. As soon as the fireworks started going off the dogs must have gotten scared. AJ which was a golden retriever became so scared that he broke through the back fence. Rick was soon to follow. We came home and the dogs were gone. Shortly after we arrived home, we received a call that AJ was hit by a car. He was more scared of the loud bangs then he was of cars. They told us he was in bad shape. AJ broke his leg and had to have surgery. They asked us if we wanted to spend the money to try to save him or should they put him down. We opted for trying to save him. We brought him and Rick home and AJ died anyhow a couple months later. There was just too much damaged with him. The following day as I was heading to a bus stop. I noticed two dogs that must have been tied to leases in their back yards. These adult dogs became so scared that they tried to jump the back fence of their homes and ended up hanging themselves. My husband and I have never left our dogs at home alone or unsupervised on the 4th of July or on New Years. This was such a horrific experience that I would never want to live through again and I would never want to put my dogs through again. 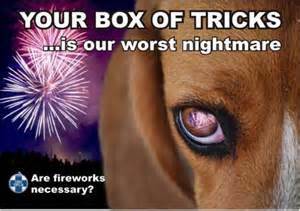 Dr. Marty Becker of Vetstreet.com points out that it’s perfectly logical for dogs to hate fireworks: “Fireworks are bombs, for Pete’s sake. 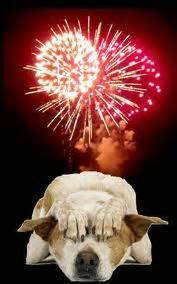 It makes sense to be scared!” Marc Elias, principal officer of Pooch Pals LLC, agrees: “Simply put, fireworks, to your dog, is like an artificial lightning/thunderstorm times ten!” Humans may come to enjoy the explosive annual tradition, because of the visual payoff . And many dogs’ method of coping — bolting at top speed, then hiding — is why animal shelters see such a big uptick in intakes right around the Fourth, Elias adds. “There are two directions they can take, flight or fight. Not only are there the phobia dangers, there is the health risks to our pets if they should get into them. I found this list on petmd.com… Not all states allow fireworks unless they are done by the city. But if you live in a state like I do, this may help you keep your pets safe. As with any poison, the severity of the poisoning is dependent on the type of firework, the amount ingested, and what type of coloring agents it contains. Thankfully, severe poisoning isn’t very common. Finally, don’t let your dog near the backyard fireworks show you may be having. Fearless, unsupervised dogs may actually be curious enough to approach a lit firework, resulting in thermal burn injuries to the nose, face, lips and mouth, as well as eye irritation. Avoid any problems by keeping pets a safe distance from fireworks — lit or unlit! I didn’t do this blog posting to stop you from having a nice fourth of July and enjoying fireworks. I did this so that everyone is aware that what is fun for us, isn’t always fun for our pets. We need to make sure our pets are safe.